This morning in Huntington at 8:15AM it’s currently 70 degrees under clear skies. Winds are light. Relative humidity is 75%, dewpoint 63, barometric pressure 29.64″ and steady. 24hr high was a muggy 87, low 55. We’ll have another day of above normal temperatures with sunny skies and highs in the mid 80s. Winds will be out of the southwest at 10 to 15 mph with gusts up to 30 mph. Tonight should be mostly clear with lows in the upper 50s and southwest winds around 10 mph gusting up to 30 mph until midnight, then becoming light and variable. Sunday should start out partly sunny with a chance of showers and thunderstorms in the afternoon. Highs will be in the upper 70s with west winds around 10 mph, becoming northwesterly in the afternoon. Chance of rain is 30%. Sunday night should be partly cloudy with a chance of showers and thunderstorms. Lows will be in the mid 50s with northwest winds around 10 mph. Chance of rain is 30%. Monday’s looking partly sunny with a chance of showers and thunderstorms. Highs will be in the upper 70s with west winds around 10 mph and gusting up to 25 mph. Chance of rain is 30%. Monday night should be mostly clear with lows in the mid 50s. Last year on this date we had a high of 72 and a low of 55. We picked up 0.43″ of rain. Burlington norms for this date are highs of 80°F and lows of 58°F. Record high was 93°F in 1946. Record low was 42°F in 1936. Tomorrow will be 0m 44s shorter. The Moon is waxing gibbous, 10d 21h old with 85% illumination. Tonight is “leap second” night as the official time keepers of Greenwich Mean Time will add one second to the last minute of the day tonight. This is the first time in 3.5 years that this has been done. It’s necessary to bring the world’s clocks back into sync with the Earth because of tidal friction within the Earth and a few other factors. There’s an interesting article on the “leap second” here. 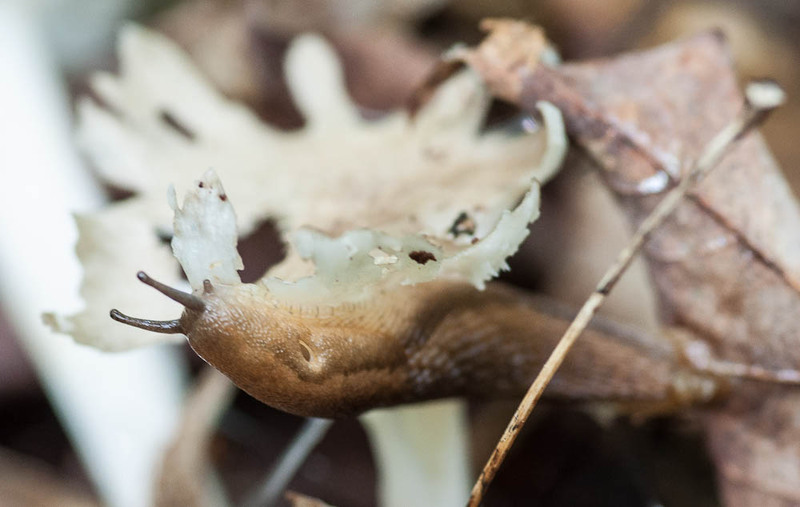 A slug munches on a mushroom out in the woods. This morning in Huntington at 6:20AM it’s currently 60 degrees under overcast skies. Winds are calm. Relative humidity is 99%, dewpoint 60, barometric pressure 29.63″ and rising. We picked up 0.03″ of rain overnight. 24hr high was 80, low 54. The weak and fast moving surface trough that brought overnight and morning showers to the region should move to the east early. We’ll see scattered showers and thunderstorms this morning, then mostly sunny skies and warmer temperatures with highs in the upper 80s. Winds will be out of the south around 10 mph becoming westerly this afternoon. Chance of morning rain is 40%. Tonight should bring clear skies with lows in the upper 50s and southwest winds 10 to 15 mph. Saturday should be mostly sunny with highs in the mid 80s and southwest winds 10 to 15 mph. Saturday night should be partly cloudy with lows around 60 and southwest winds around 10 mph. Sunday’s looking partly sunny with a 40% chance of showers as a weak cold front moves through the region. Highs will be around 80 with northwest winds around 10 mph. Sunday night should be mostly cloudy with a 30% chance of showers and lows in the upper 50s. Last year on this date we had a high of 72 and a low of 57. Burlington norms for this date are highs of 79°F and lows of 58°F. Record high was 96°F in 1944. Record low was 37°F in 1919. Tomorrow will be 0m 40s shorter. The Moon is waxing gibbous, 9d 19h old with 75% illumination. 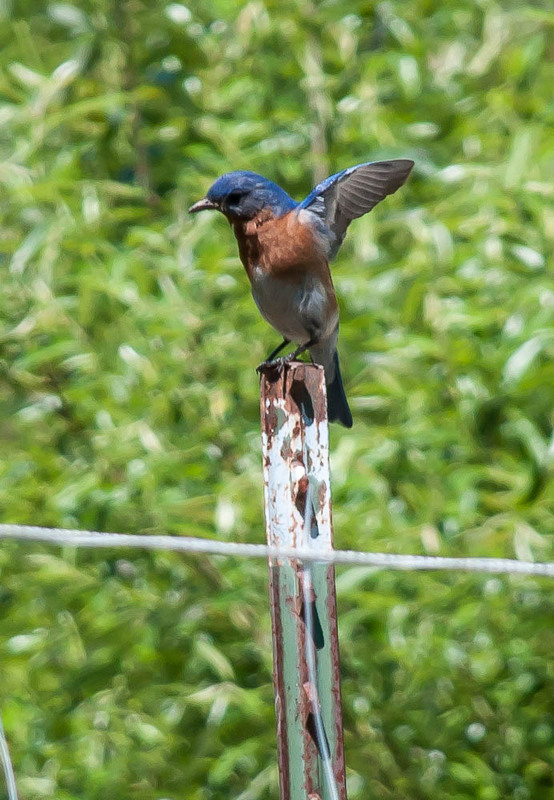 A bluebird lights on a post in our front veggie garden. This morning in Huntington at 6:15AM it’s currently 58 degrees under overcast skies. Winds are calm. Relative humidity is 99%, dewpoint 57, barometric pressure 29.74″ and steady. We picked up 0.36″ in the last 24hrs (and 1.62″ recorded the morning of 6/27). 24hr high was 63, low 57. The slow moving nor’easter low pressure system that’s been stuck over the region for the past several days is slowly rotating out to sea over the Canadian Maritimes. Any morning showers should give way to partly sunny skies and much warmer temperatures today. Highs will be around 80 with west winds 10 to 15 mph. Chance of rain is 20%. Tonight should be clear until midnight, then mostly cloudy with a chance of showers and a slight chance of thunderstorms after midnight as a surface trough and associated cold front move across the region. Lows will be in the upper 50s with southwest winds around 10 mph until midnight becoming light and variable. Chance of rain is 30%. Friday should start out mostly cloudy with a chance of showers in the morning, then become partly sunny. Highs will be in the mid 80s with south winds around 10 mph, becoming westerly with gusts up to 25 mph in the afternoon. Chance of rain is 30%. Friday night should be clear with lows in the upper 50s and southwest winds 10 to 15 mph. Saturday’s looking mostly sunny with highs in the mid 80s and southwest winds 10 to 15 mph gusting up to 25 mph. Saturday night should be partly cloudy with lows in the upper 50s. Last year on this date we had a high of 79 and a low of 53. Record high was 95°F in 1991. Record low was 43°F in 1927. Tomorrow will be 0m 34s shorter. The Moon is waxing gibbous, 8d 19h old with 65% illumination. 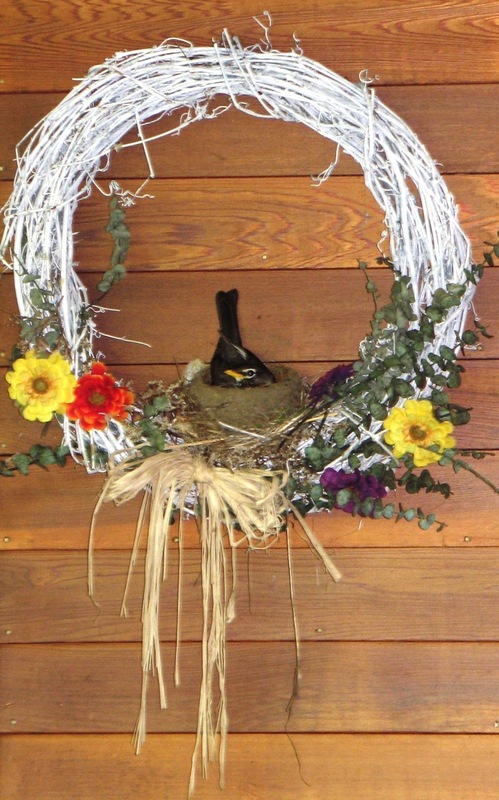 George Mincar of Highland Drive shared this photo of a robin nesting on his front porch. Thanks George! This morning in Huntington at 6:25AM it’s currently 53 degrees and raining just a bit under overcast skies. Winds are calm. Relative humidity is 98%, dewpoint 52, barometric pressure 29.67″. We picked up 0.49″ of rain in the past 24hrs. 24hr high was 69, low 52. The slow moving upper level low pressure system that moved in yesterday will continue to influence our weather for the next couple of days. We’ll see cloudy skies with isolated showers this morning, then occasional showers with isolated thunderstorms this afternoon. Highs will be in the lower 60s with northwest winds around 10 mph. Chance of rain is 80%. Tonight should bring occasional showers. Lows will be in the mid 50s with northwest winds around 10 mph. Chance of rain is 80%. Wednesday should bring occasional showers. Highs will be in the mid 60s with northwest winds 10 to 15 mph. Chance of rain is 80%. Wednesday night showers are likely. Lows will be in the mid 50s with light and variable winds. Chance of rain is 60%. Thursday’s looking partly sunny with a 30% chance of showers as the low moves off into the Canadian Maritimes. It’ll be warmer with highs in the mid 70s and northwest winds around 10 mph. Thursday night should be partly cloudy with lows in the upper 50s. Last year on this date we had a high of 73 and a low of 57. We picked up 1.09″ of rain. Burlington norms for this date are highs of 79°F and lows of 57°F. Record high was 96°F in 2007 (we had a high of 91). Record low was 41°F in 1979. Tomorrow will be 0m 27s shorter. The Moon is a waxing crescent, 6d 19h old with 42% illumination. I’ll be on the road tomorrow morning for a gig, so no post tomorrow. See you again on Thursday! 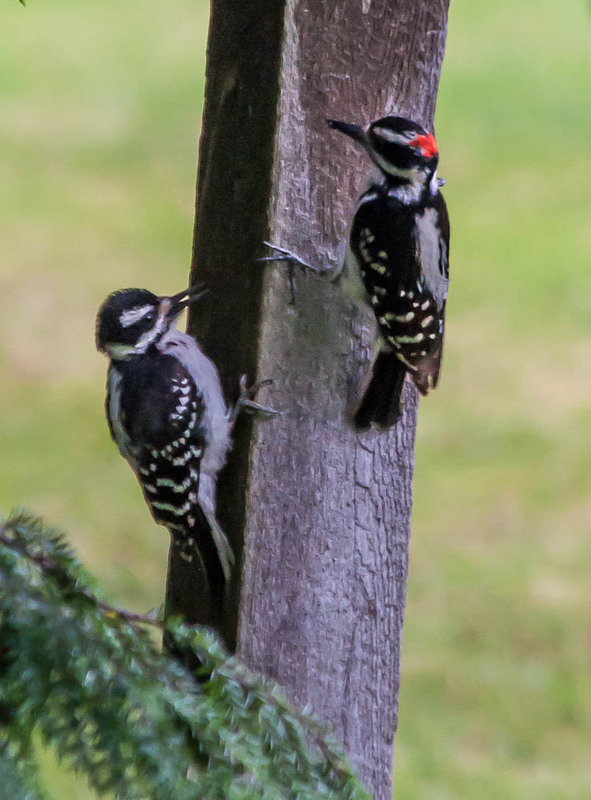 A hairy woodpecker and its fledgling investigate our bird feeder post this morning. This morning in Huntington at 6:55AM it’s currently 59 degrees under overcast skies. Winds are calm. Relative humidity is 99%, dewpoint 59, barometric pressure 29.72″ and falling. We picked up 0.45″ of much-needed rain overnight. 24hr high was 81, low 57. A strong low pressure system and a cold front will move into the region today and stall over us for the next couple of days. We’ll see numerous showers with isolated thunderstorms during the day today. Highs will be in the upper 60s with light and variable winds becoming northwesterly around 10 mph this afternoon. Chance of rain is 70%. Tonight should be cloudy with showers likely mainly until midnight. Lows will be in the lower 50s with northwest winds around 10 mph until midnight becoming light and variable. Chance of rain is 60%. Tuesday showers are likely. Highs will be in the mid 60s with light and variable winds becoming northwesterly around 10 mph in the afternoon. Chance of rain is 70%. Tuesday night showers are likely. Lows will be in the mid 50s with northwest winds around 10 mph. Chance of rain is 70%. Wednesday showers are likely. Highs will be in the upper 60s with northwest winds around 10 mph. Chance of rain is 70%. Wednesday night should be partly cloudy with a 40% chance of showers. Lows will be in the mid 50s. Last year on this date we had a high of 74 and a low of 57. We picked up 0.21″ of rain. Record high was 94°F in 1995. Record low was 39°F in 1979. Tomorrow will be 0m 22s shorter. The Moon is a waxing crescent, 5d 20h old with 32% illumination. 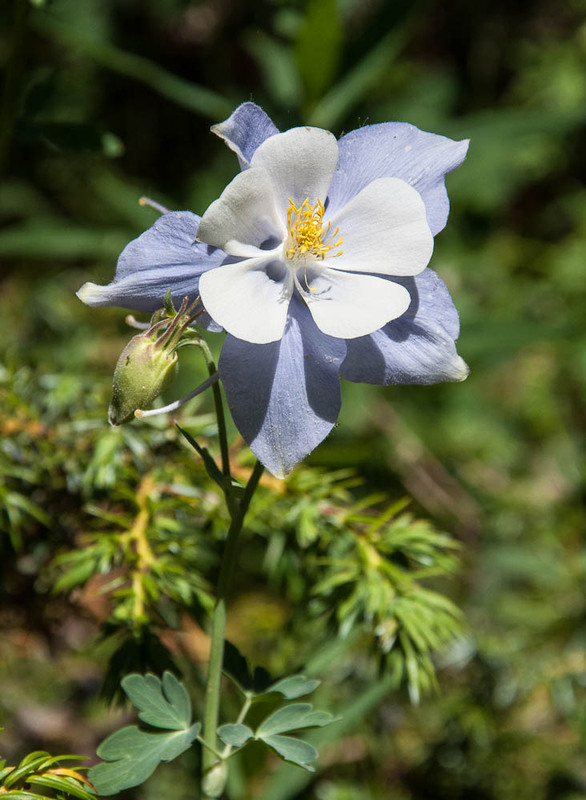 Colorado blue columbine blooming near Winter Park, Colorado. This morning in Huntington at 7:35AM it’s currently 56 degrees under clear skies. Winds are calm. Relative humidity is 99%, dewpoint 56, barometric pressure 29.96″. 24hr high was a much more comfortable 76, low 48. We’ll start out the day today with sunny skies followed by partly sunny skies with a slight chance of showers and thunderstorms this afternoon as high pressure moves off to our east. Highs will be in the upper 70s with light and variable winds becoming northwesterly around 10 mph this afternoon. Chance of rain is 20%. Tonight showers and thunderstorms are likely as a strong high pressure system and attendant cold front move into the region from the west. Lows will be in the upper 50s with light and variable winds. Chance of rain is 70%. Monday showers are likely with a chance of thunderstorms. It’ll feel kind of chilly with highs making it only into the upper 60s with light and variable winds. Chance of rain is 60%. Monday night should be mostly cloudy with a 50% chance of showers. Lows will be in the lower 50s with light and variable winds. Tuesday showers are likely with highs again in the mid 60s and northwest winds from 10 to 15 mph. Chance of rain is 60%. Tuesday night showers are likely. Lows will be in the mid 50s. Chance of rain is 70%. Last year on this date we had a high of 64 and a low of 57. 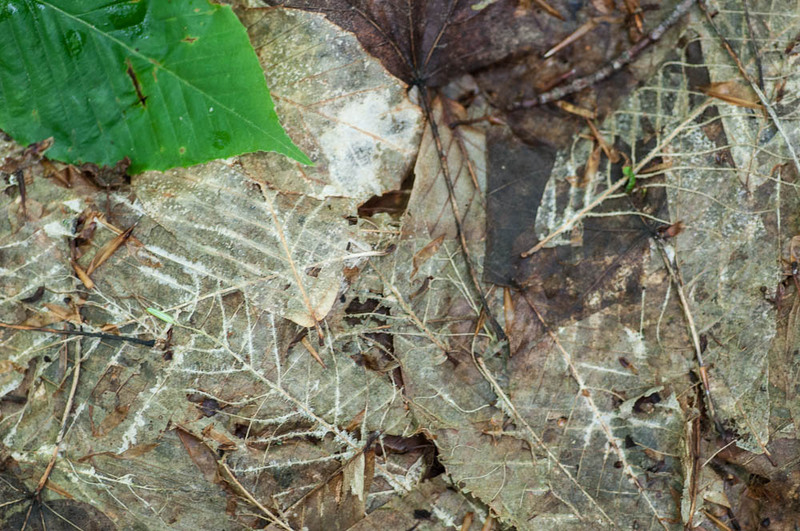 We picked up 0.50″ of rain. Record high was 96°F in 2003 (we had a high of 86). Record low was 40°F in 1988. Tomorrow will be 0m 18s shorter. The Moon is a waxing crescent, 4d 29h old with 23% illumination. 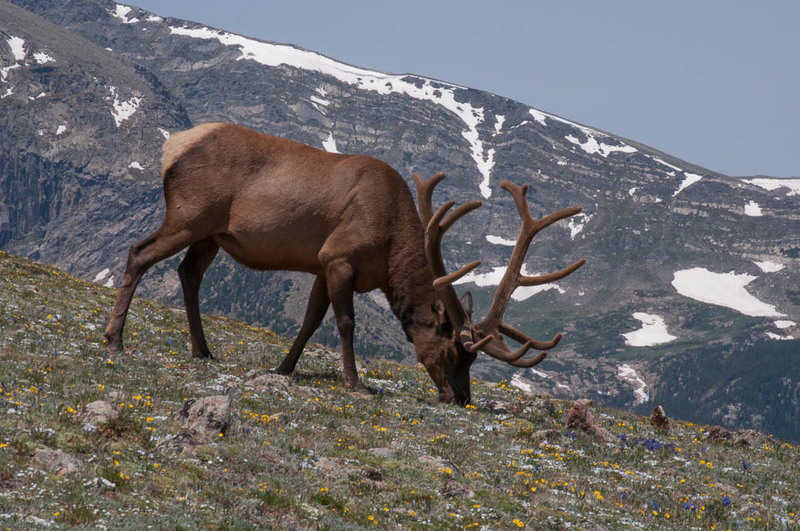 A bull elk grazing in the tundra at around 12,000′ in Rocky Mountain National Park. This morning in Huntington at 8:55AM it’s currently 66 degrees under partly sunny skies. Winds are out of the north at 0-3 mph. Relative humidity is 87%, dewpoint 62, barometric pressure 29.86″ and rising. 24hr high was 81, low 54. Cooler and more unsettled weather is in the cards for us for the next several days. We’ll see partly sunny skies with a chance of showers and thunderstorms this afternoon as an upper level disturbance moves into the area. Highs will be in the upper 70s with light and variable winds, becoming northwesterly around 10 mph this afternoon. Chance of rain is 50%. Tonight should be partly cloudy with a slight chance of showers and thunderstorms until midnight, then mostly clear after midnight. Lows will be in the mid 5os with light and variable winds. Chance of rain is 20%. Sunday should start out sunny in the morning then become partly sunny. Highs will be in the lower 80s with light and variable winds. Sunday night showers are likely as a low pressure system and associated cold front move into the region. Lows will be around 60 with light and variable winds. Chance of rain is 70%. Much needed rain will continue into the workweek with showers likely on Monday. Highs will be in the lower 70s with light and variable winds. Chance of rain is 70%. Monday night should be cloudy with a chance of showers. Lows will be be in the mid 50s. Chance of rain is 50%. Last year on this date we had a high of 70 and a low of 61. We picked up 0.31″ of rain. Record high was 93°F in 1975. Record low was 41°F in 1940. Tomorrow will be 0m 14s shorter. The Moon is a waxing crescent, 3d 22h old with 15% illumination. We got back from Colorado (the Winter Park area) yesterday afternoon. It sure was a change exiting the airport to the moist eastern air after a week in the near-drought dry of the Rocky Mountains. I gather we missed a “nice” heat wave here with highs in the 90s and high humidity (we recorded 92 degrees here on the 20th and 21st with dewpoints of 75 degrees both days). Can’t say that I’m sad we missed that as it’s certainly not my favorite kind of weather. By contrast, the Rockies were dry dry dry and the family was struck with how much water we needed to drink and how much skin moisturizer we needed to use every day. It was certainly lovely though, and Rocky Mountain National Park was a real treat! Still, it’s good to be back home, and we even brought back some cooler weather for you!